In the home theater furniture world, there have been a number of new introductions in 2010. One of the blockbuster arrivals to theater seating this year is the Magnolia home theater seat. It incorporates some of the best features from other top sellers and includes them all in one great design. The primary feature additions to this seat are the higher seat back and the hidden storage in the arm rests. The storage compartments exist in all arms and provide the perfect location for one's remote controls and tv guides. The design of these storage compartments addresses serious flaws in other models designs like the lack of sufficient support on the hinge that opens holds the storage lid. In the Magnolia this is double-hinged and provides years of safe use without any warping or movement to the hinge mechanism that might not result in the lid closing properly. Another important features that was addressed is the higher seat back to 44 inches that seems to have always been a missing ingredient to some predecessors. This gives the right amount of upper back and neck support to anyone who needs it. The seat is available in black and brown on quick ship and in hundreds of different colors through custom order in either leather, leather match, bonded leather or fabrics. 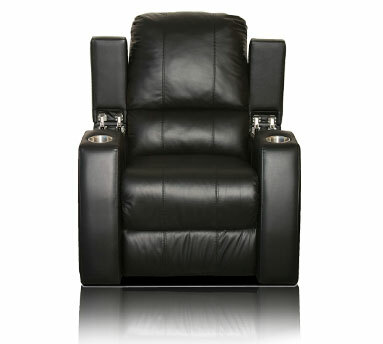 Prices for black and brown are $649 in manual and $749 in power recline. Thanks for the great news.I really looking forward to visit there.and I like Magnolia home theater seating.